Gasoline is produced mostly for car engines, which burn through it in a relatively short time span. It is not meant to be used more than 30 days from when it was pumped. If it is left in the lawn mower gas tank over the winter season, you will be unable to start the engine come spring. When draining out old gas in your lawn mower, you can put it in your car. This will not harm your car and is environmentally more sound than throwing it away. Start your lawn mower and allow it to run until all the gas is used. 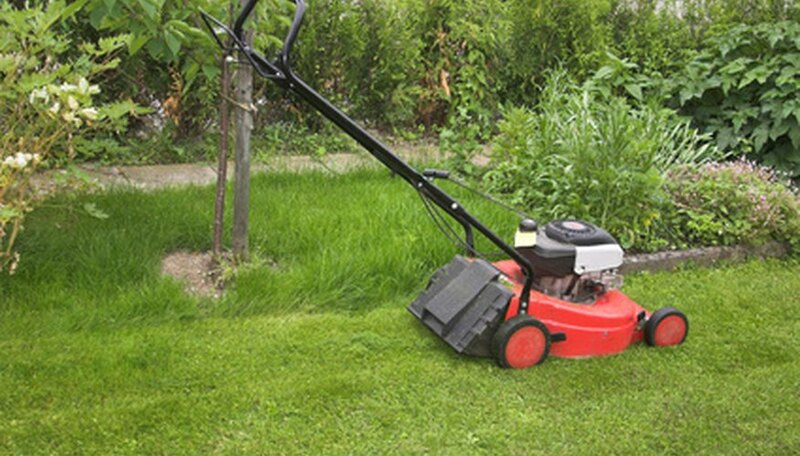 If you cannot get your lawn mower to start, you will need to siphon the old gas out using a small plastic hose. Insert a garden hose into the gas tank and turn it on full power. Rinse and repeat two to three times or until the water is running out fairly clear. Dry the inside of the gas tank. You can either allow it to sit for a few days or use a hair dryer to dry it quicker. Pour a gas tank cleanser into the tank. This can be purchased at your local hardware store. Allow it to sit for a few hours so it can break down any dirt and rust still in your tank. Pour the cleanser out into a 5-gallon bucket. Rinse out the gas tank with the garden hose again and allow to dry. Fill it with fresh gas. Why Does My Lawn Mower Keep Stalling?